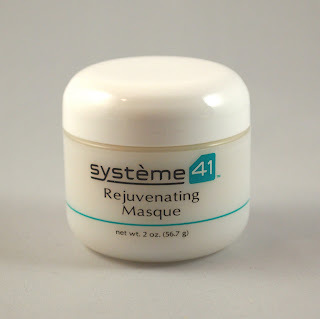 I didn't know what to expect when I received a box of Systeme 41 products. For some reason, it reminded me of the Proactiv design and I wondered how it could be a "green" product. However, after further research, I found out that the idea behind this line is that it has mild ingredients and none of the harsh chemicals found in conventional products. I tested out the Rejuventaing Masque to see how well it would perform. This product seemed to work well, but I found it more useful as an exfoliator than as a masque. When used as a masque, my skin felt warm and tight, which I found slightly uncomfortable. Also, the product will be used up much faster if used as a masque. It is gentler when using it as an exfoliator and has nearly the same results (softens skin). I'd really like to see the Systeme 41 site use a cleaner, more image-based design and sell their products under a simpler pricing structure. The current layout reminded me of a made-for-TV ad, which led me to be skeptical of a product that, upon further examination, seemed to have good ingredients and performed well when used an exfoliator.